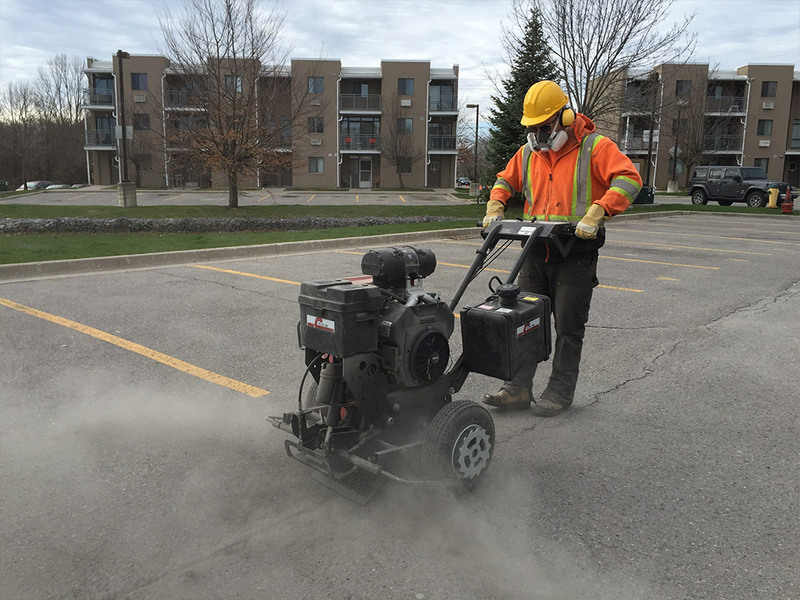 For more than 23 years, property managers and owners in Durham Region and throughout the GTA have turned to the team at Pavement Solutions for all their pavement maintenance needs. We work with you to design a pavement maintenance plan that meets the unique needs of your property, taking into consideration your timeline and budget. You can trust us to complete every job precisely, efficiently, and to your exact specifications. 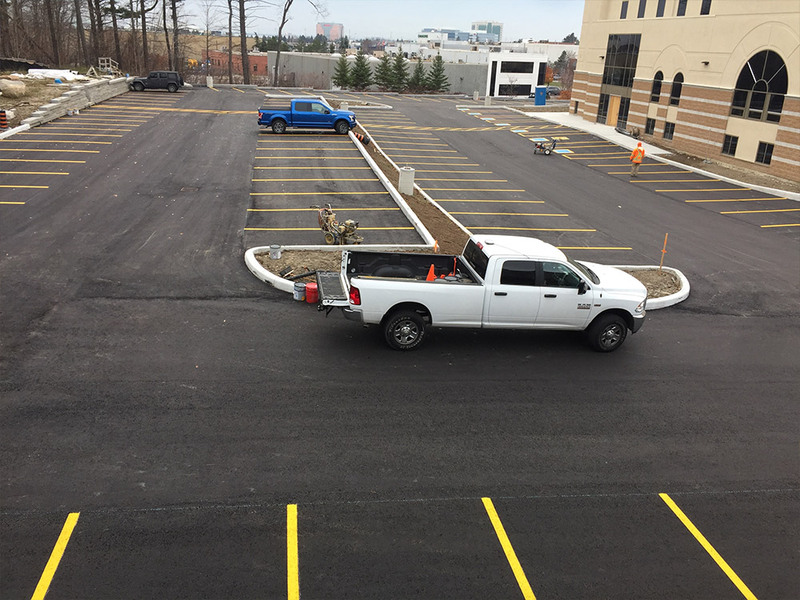 A quality line painting job can make the difference between a polished-looking project and a sloppy one. 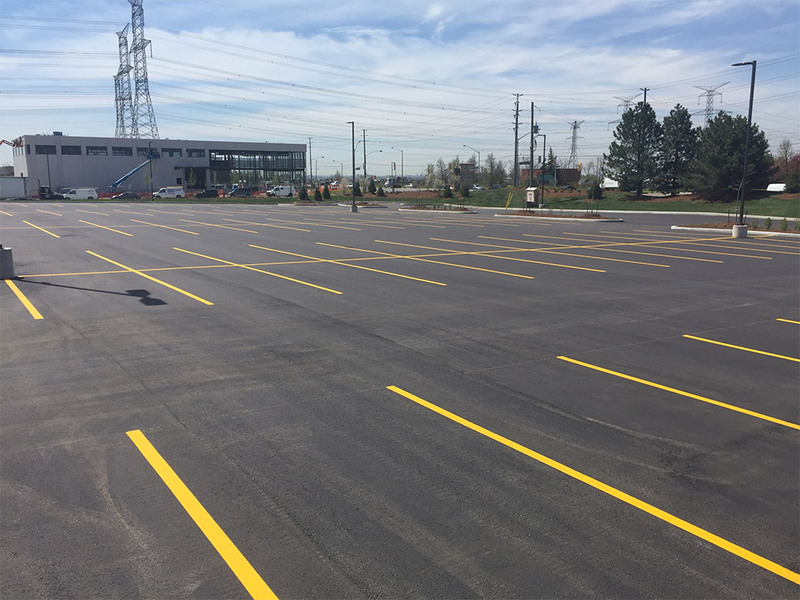 Whether it’s striping after a full re-pave, re-painting your existing parking lot layout, or designing and painting a new layout, our crew take pride in their workmanship. 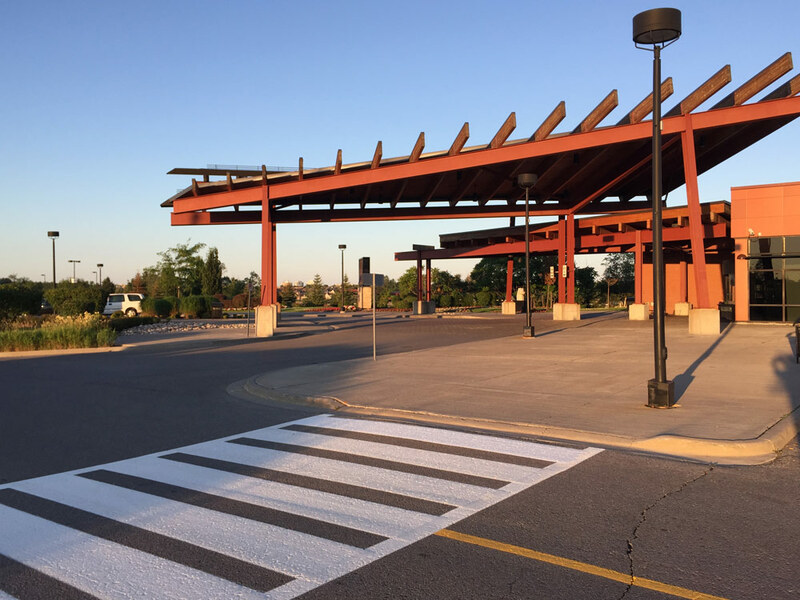 For line painting in Pickering, we use the latest and most heavy duty pavement marking equipment, such as our Graco 5900 dual gun commercial line striping machines. Each is equipped with LaserLine Mfg GL1000 Guidance Lasers and GL1700 Spot Lasers for efficient and precise painting of each customer’s project. 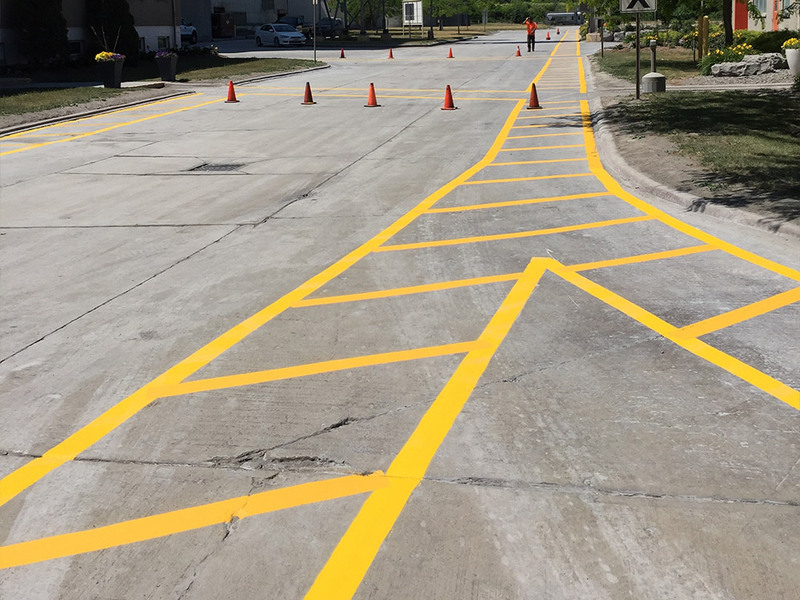 Through continuing education, our crew members are cross-trained on all our equipment and in every aspect of line striping. They know the legal clearance required to paint safe and streamlined layouts for optimal traffic flow. They are familiar with legal clearances for fire routes, driveways, loading zones and drive-thru’s. 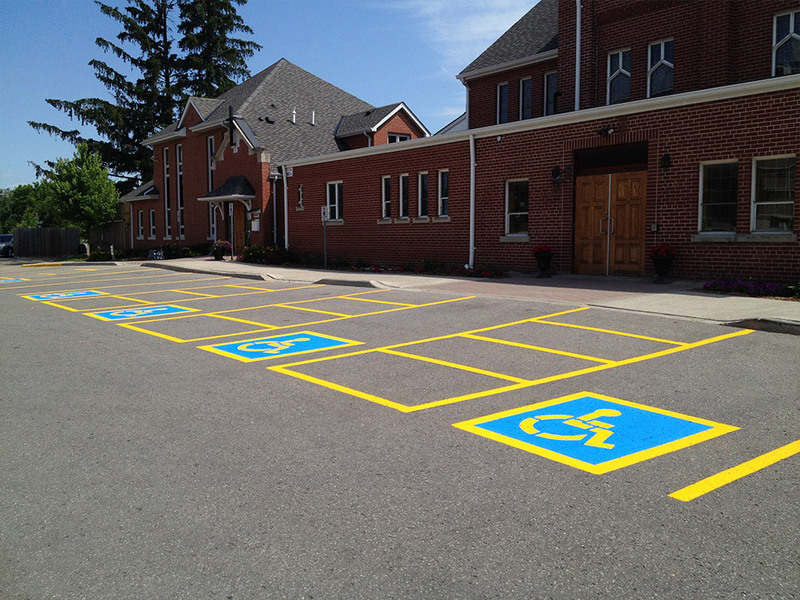 Perhaps most importantly, Pavement Solutions will ensure that the Accessible Parking stalls that serve your property are properly located, signed, dimensioned and painted with the proper symbol to meet your municipality’s building code. At Pavement Solutions Inc, we exclusively use Sherwin-Williams Traffic Marking paints - the best on the market - for long lasting projects. 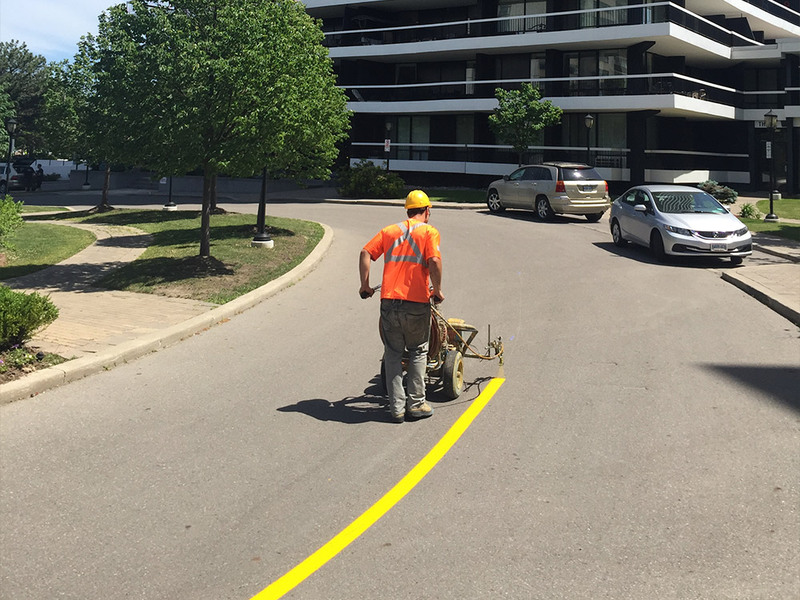 Call today to learn about our line painting services. 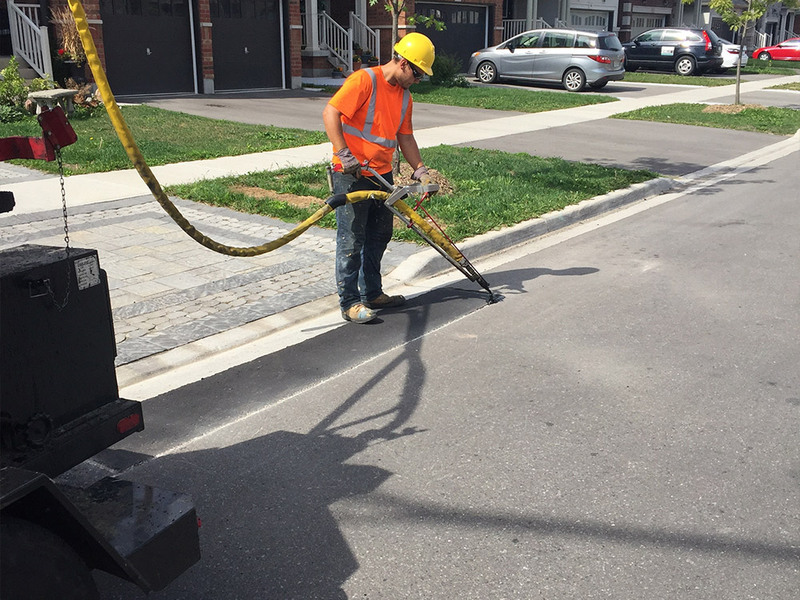 At Pavement Solutions Inc, we offer hot rubberized crack sealing in Pickering and the Durham Region. As a critical element of an asphalt surface’s preventative maintenance, sealing cracks using a process known as “rout and seal”, should be undertaken on a regular basis. Cracks are cut open with a pavement router, to allow ample rubberized sealant into the crack. Once the hot rubberized crack sealer is applied, the crack is permanently sealed with the flexible material. A pavement whose cracks are properly sealed lasts years longer than a pavement left to deteriorate. 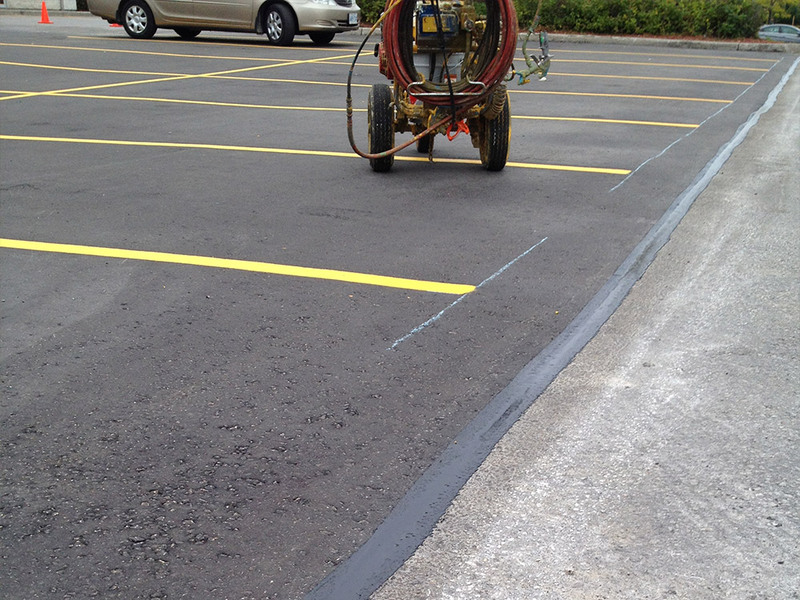 Sealing new cracks in asphalt also significantly reduces maintenance costs over its lifespan. 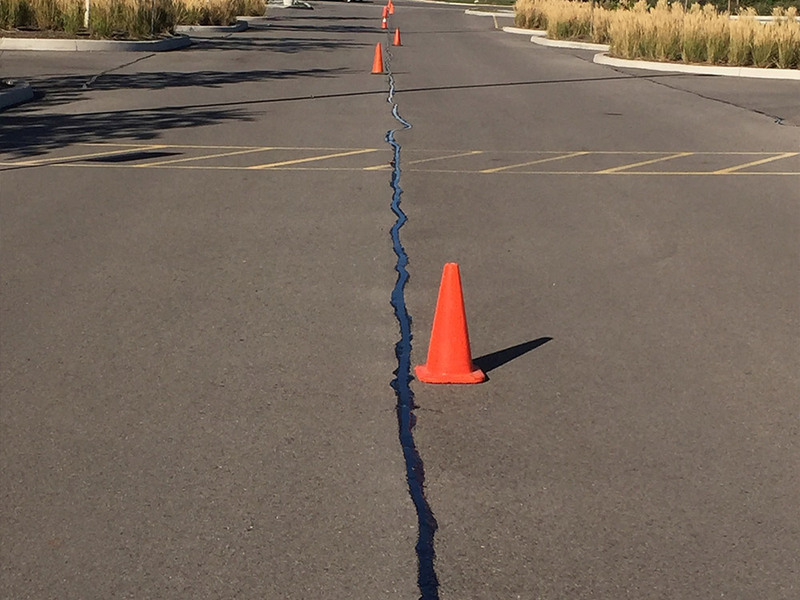 Municipal, industrial and commercial property managers prioritize routine hot rubberized crack sealing for their paved surfaces. By rendering the cracks water-tight, the sealant helps protect the pavement and its base. Our rout and seal process for crack sealing meets all MT.O. specifications, as well as all new civil engineering requirements. 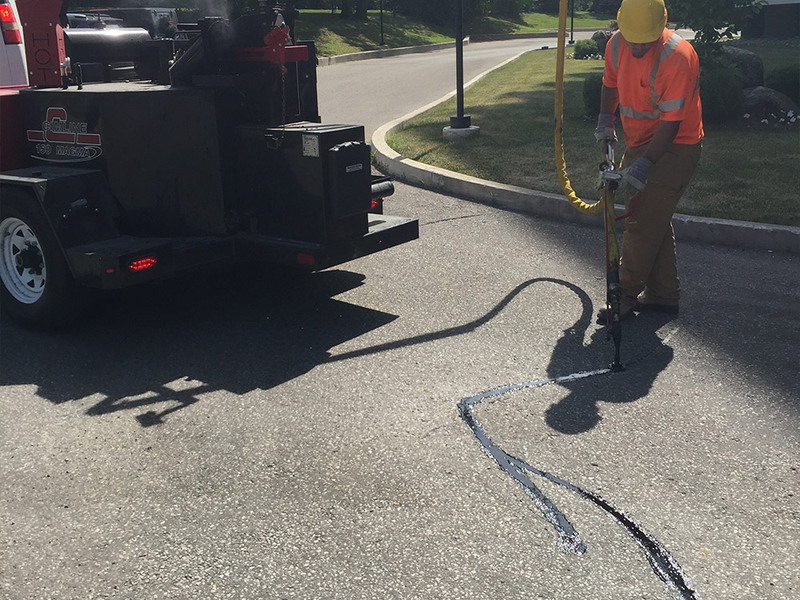 Performing proper crack sealing requires extensive training for the crew, as well as some highly specialized equipment. 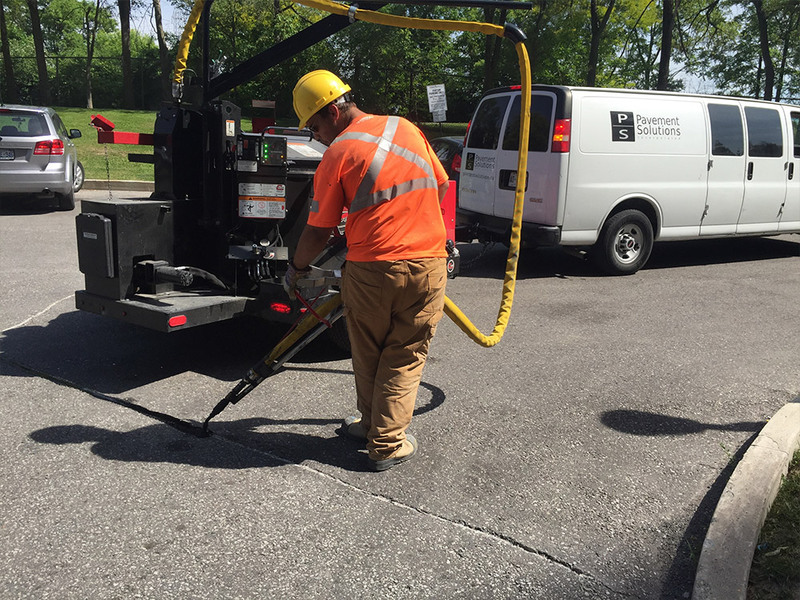 Pavement Solutions invests annually in the latest and most efficient crack sealing equipment. Every piece of equipment, from our Cimline PCR-25 and PCR-30 pavement routers to our Cimline Magma heated hose material kettle, has been chosen to complete top-notch projects for our customers and to provide a safe work environment for our crews. To learn more about the benefits of hot rubberized crack sealing, call our team today. Signs in your parking lot direct people where to park and give directions and guidance. Many traffic signs are required under municipal and provincial law. Our signs feature 3-M light-reflecting surfaces and can be affixed to steel posts, buildings or other structures. Custom sign designs and sizes are always available. Pavement Solutions brings decades of experience to your pavement projects. We dedicate ourselves to exceeding your expectations and providing you with a beautiful and strong result. We take on projects of all sizes, from extensive “remove and replace” projects, right down to economical pothole repairs. Trip and fall liability is a major concern for property managers and owners. Uneven concrete slabs present dangerous tripping hazards for pedestrians and can make your property inaccessible to those with limited mobility. Grinding down these trip hazards is vital to keeping your property safe. Bollards and curbs are important elements of every parking lot. They protect building corners, entrances and gas meters. Steel bollards are typically fitted with maintenance-free, high-density polyurethane sleeves. Our 8-foot precast concrete curbs are placed by crane truck. We use steel spikes to securely pin them in place. Speed bumps are critical elements for keeping traffic moving at a safe speed. Our rubber speed bumps do not require re-painting and can be installed quickly and economically. These speed bumps can also be removed during winter months to accommodate snowplowing operations. With a renewed emphasis on workplace safety, warehouse floor markings are important elements for keeping warehouses safe. From marking fire exit doors and first-aid stations to painting pedestrian walkways and forklift roadways, we help keep your workplace safe. Our crews will get your project done during off-hours or during planned facility shutdowns. Call today to learn more about our pavement services. Speak to our pavement team.